We’ve redesigned our interface for changing speed. The main difference happens when you click the current speed: you’ll see a little popup instead of editing the speed inline. We made this change because it gives us some extra space to add a new feature. If you’re using the synth player and have changed the BPM from its default value, we’ll now display a “Reset to [default]” button. 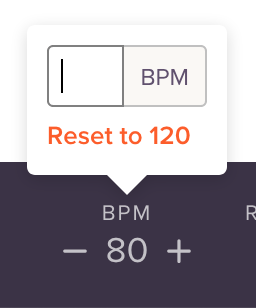 This closes a loophole we opened about a month ago when we changed the speed to use BPM; it wasn’t possible to reset the BPM without knowing what the original BPM was. This was a much-requested feature. Previously, if you enabled the “Play with count-in” option and set a loop, you’d only hear the count-in one time. Now, the count-in plays each time through the loop. All paying Soundslice customers now get a nice badge next to their username throughout the site. It’s a modest way for us to give thanks. Finally! You can now copy and paste notation across separate tracks in our notation/tab editor. The new Option+Up and Option+Down keyboard shortcuts move tab notes up or down a string, retaining their pitch. If you’re a paying customer, you can customize the keyboard shortcut. Look for “Move note up a string, retaining pitch” in the shortcut menu. If you’d like to sync a slice with an MP3, but you don’t want to upload it to our servers for whatever reason (say, you already have a web host), you can use our new “MP3 URL” recording type. When you add a recording, just select “MP3 URL” and enter the URL of your MP3. It works just like our “MP4 URL” feature if you do your own video hosting. The account settings page now has a way for you to update your PayPal payment info for getting your payouts. Previously you had to email us to do this. We now display courses directly on your user profile, for higher visibility. Previously they were accessible via the “Courses” tab (which is still there). We’ve added a payout history page, which gives you a convenient summary of all the payouts you’ve gotten from Soundslice sales. Our music player is now available in 10 languages! By default, the language is chosen based on your system settings. If you’d like to change it, you can open our player’s Settings menu and set the language explicitly. Is your own language missing from our list of supported languages? We’d love to expand our list, and we could use your help. Contact us and let us know which language you can help translate. We haven’t yet translated the rest of our site, including our notation editor, store or community area; our top priority was our music player, which is our core product. We hope to tackle the rest of the site in the future. If you’re embedding the Soundslice player in your own website, our player will automatically choose the language based on your users’ language setting. Due to web browser restrictions with third-party cookies, the embedded player doesn’t display the language selector in Settings. But, you can manually specify the player’s language with the new lang URL parameter, documented here. For example, if your own user authentication system lets users specify a language, you can then easily pass that preference to Soundslice. Today we’ve launched a new feature that many people have asked for: a left-handed view of the fretboard visualization. From now on, when you open the fretboard, you’ll see an icon at upper left that lets you switch between right-hand (default) and left-hand view. It’s the little hand icon. Click that, and the fretboard will instantly flip to a left-handed view. Click it again to go back to right-handed view. 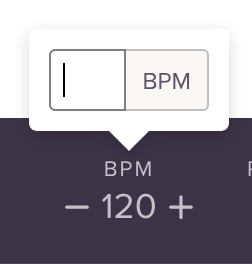 Today we’ve changed how our playback speed selector works: you now specify the speed in BPM (beats per minute) instead of a percentage, if you’re using synthetic playback. “Real” recordings, such as MP3s or videos, still use a percentage. The idea here is to better reflect how musicians think about tempo. If you’re learning a fast piece of music, starting slowly and building up tempo, then it’s more natural to think in BPM than an arbitrary percentage. It’s also a bit presumptuous to grant a specific tempo “100 percent” status, in cases where you don’t have a reference recording you’re trying to mimic. Often there’s no absolutely right or wrong tempo. If the slice is synced with a real recording, then you change speed in percentages (the right example). If the slice doesn’t have a real recording, or you’ve chosen “Synthetic” playback, then you change speed in BPM (the left example). At the risk of complexity, we think this dual-purpose interface strikes a nice balance for the two learning approaches. Let us know what you think. We’ve made a big change to our player today: it now has a prominent loop button, which makes it simple to loop a section of music. Looping has always been a core part of the Soundslice experience — just drag across any notation to loop that section. But we’ve repeatedly found that some people don’t realize they can do this. In a world of PDFs and static images, the concept of “interactive” sheet music is still new and unexpected. That’s why we’ve introduced this button. When you click it, the player will create a looped selection that spans whatever bar your playhead is in. You can then drag its edges to resize it to your liking. As part of this change, we’ve also improved the way loops look. They now have “grabbers” on either edge, which helps communicate that they’re resizable. Dragging to resize loops was already possible — but (again) we found people didn’t realize they could do it. The new design makes it much clearer! 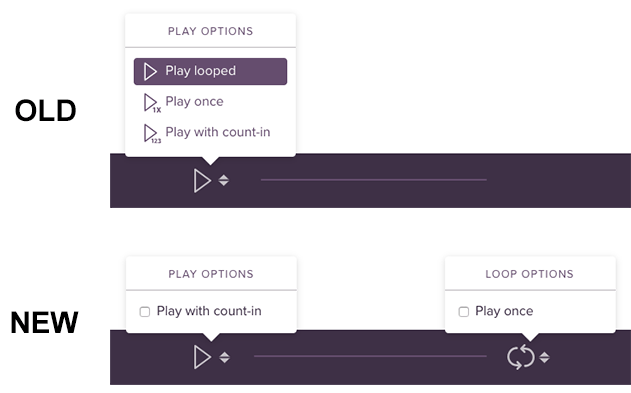 Finally, we’ve clarified our player’s “play options.” Previously, clicking the double-arrow next to the Play button would give you three options: Play looped, Play once or Play with count-in. Now that we have a separate loop button, we’ve put the “Play once” option in the loop button’s menu, which simplifies things. We hope you enjoy these changes!